2019 marks the 100th anniversary of the founding of the Third International, Communist International or Comintern, the organization of the proletarians, workers and workers of the world, which sought to give continuity to the struggle in a meaningful way, after the Second International, and the parties which formed it betrayed the cause of the proletariat, the irreconcilable struggle against capitalism and imperialism. On March 2 and 3, 1919, Lenin, Stalin and the Bolsheviks, together with other genuine communist parties, took up the task of breaking with the opportunists of the parties of the Second International, and continuing on the path of the world proletarian revolution. 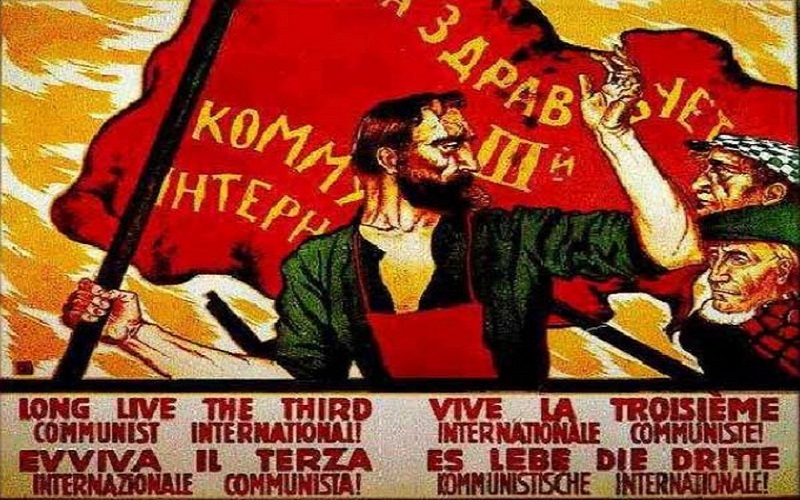 The Third Communist International is the continuity of the effort derived from the first experience, developed by the workers at the time of the emergence of capitalism, with Marx and Engels at the head, along with leading figures of the workers and proletarian movement of that time. Karl Marx and Frederick Engels the pioneers of the First International, called the International Workeringmen’s Association, were not only the consistent builders but the influential ideologists who laid the foundations of the scientific communist theory of the Party of the proletariat. In that effort, one of the first struggles and ruptures occurred against the petty bourgeois conceptions represented mainly by the anarchists. This effort lasted from 1872 to 1876, when it was dissolved. This First International had an important influence on the first ever proletarian revolution, the Paris Commune. The Second International was, following experience of the period from 1889 to 1916, constituted by Socialists and Labor activists, was characterized by acting in a decentralized and independent manner by each party that formed it. Due to its ideological positions coinciding with bourgeois ideology, it was divided, on the one hand, between the Marxist parties, and on the other, the Social Democrats, which led it to reorganize itself in 1920, dissolve in 1940 and reappear in 1951, continuing to this day under the name of the Socialist International. It is precisely because of the opportunist and reformist positions of the parties of the Second International, which conciliated with the capitalists, that Lenin and Stalin give waged an ideological struggle to break with these positions, in the context of an intensification of the class struggle, of the 1st World War and the historical triumph of the proletarian revolution in Russia, to further develop the historical perspective of the proletariat.